Even hitmen have high school reunions. Even hitmen have psychiatrists. 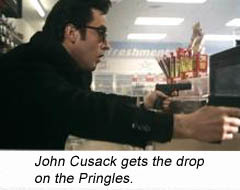 One could suppose GROSSE POINTE BLANK was a precursor/inspiration for THE SOPRANOS – and one could be whacked for it. When we attend our high school reunions, we’d all like to be able to say, “I’m a professional killer.” And have the actual accumulated technical knowledge and combat experience to back it up. That’s why this black comedy is so damn cool. John Cusack is unassuming, introspective, man-in-black Martin Blank – hitman. We meet him on a Job, where we learn his Zeroth Law: “It’s not me!” – his constant denial to marks who erroneously believe he has something personal against them; making it clear he is just Doing His Job. There’s the crux of GROSSE POINTE BLANK and the reason why even his “redemption” is not truly that, but merely a man grown tired of his profession and wanting to move on. A beautiful irony of his renunciation of the killing business is that he delivers it while systematically gunning down all the assassins sent to kill him, while he finds himself protecting the mark that he was sent to kill. 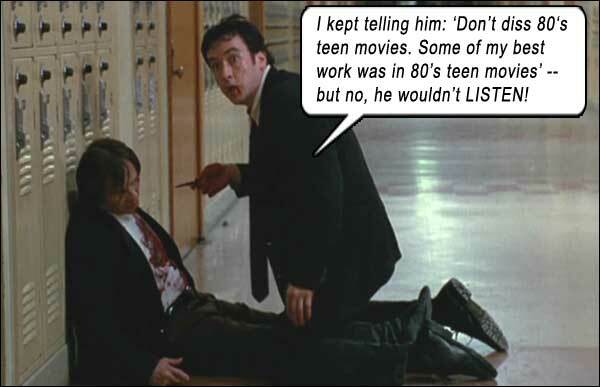 Cusack’s overacting sister Joan is his secretary, who tells him of his ten-year high school reunion at Grosse Pointe, Detroit, which also happens to be the location of his next hit. Why not kill two birds…? Well, literally. Minnie Driver is Blank’s high school flame, Debi. What are the odds that even if we’re professional killers, the chick whom we haven’t seen in ten years is still single, smokin’ and celibate when we get back to sweep her off her feet with our accumulated technical knowledge and combat experience? 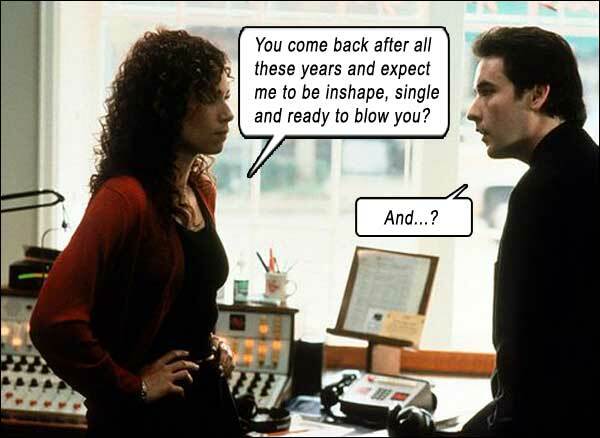 At Grosse Pointe, Blank must balance his rekindled love interest with his whack job, while taking an old school chum into his confidence (Jeremy Piven), while the NSA tail him (Hank Azaria), and the Russian mob (Benny Urquidez), and a veteran assassin (Dan Aykroyd) bent on starting a union for assassins and either signing up Blank or whacking him for declining membership. Anyone blame Blank for wanting out? While they keep pulling him back in. In the pantheon of what we term “violent” movies, or even “movies about violence,” GROSSE POINTE BLANK is an anomaly. There are gun battles and violent fights, yes, but the violence is impersonal, almost clinical, and very clean, not gory; in some cases, comedic, whenever Cusack confronts Aykroyd. As Debi weeps, having to confront this reality and denying it with every fiber of her social inculcation, he explains “…the idea of governments and nations is all public relations theory at this point.” Beautiful! Encapsulating modern geopolitics in one sentence. Burn! From the ancient Aztecs to Rome to Amerika, humans have always been murderous barbarians. Or at least Republicans. Same thing. The Aztecs had their human sacrifice pyramids, Rome had its Circus Maximus, Amerika has Guantanamo Bay. Whipcrack dialogue, dark hilarity, beautiful nihilism… GROSSE POINTE BLANK is the unique archetype by which all other hitman movies should be measured. Unless you wanna get whacked. Writers: Tom Jankiewicz, D.V. DeVincentis, Steve Pink, John Cusack. Starring: John Cusack, Minnie Driver, Dan Aykroyd, Jeremy Piven, Joan Cusack, Alan Arkin, Hank Azaria, K. Todd Freeman, Mitch Ryan, Michael Cudlitz, Benny Urquidez, Duffy Taylor, Ann Cusack.